Renault Scala launched at a starting price of Rs. 6.99 lakh! Renault launched the Scala mid-size sedan in four variants, two petrol and two diesel, at a starting price of Rs. 6.99 lakh. The Scala is a badge-engineered Nissan Sunny that retains all the positive traits of the Sunny such as space and fuel efficiency, and adds to it in terms of looks. However, the pricing is a bit too premium with a difference of Rs. 1 lakh on the base variant and about Rs. 60,000 on the top-end variants. An automatic petrol variant will also join the line up by Diwali. The Renault Scala is a badge-engineered Nissan Sunny, with plenty of cosmetic changes to the exteriors. 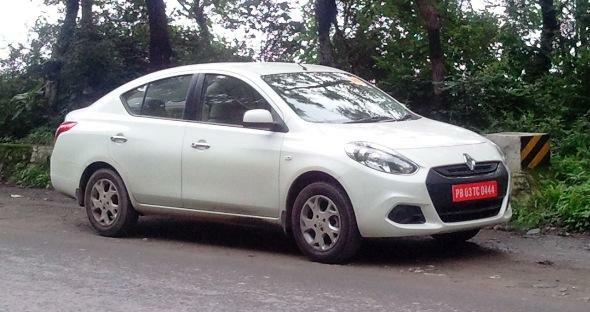 This includes a whole new front, with new headlamps, new grille, new bumper design which makes the Scala actually look a lot better than the Nissan Sunny on which it is based. It has a more aggressive and sportier look. When viewed in profile there are no evident changes, except that the top-end RXZ variant has a chrome strip along the window-line, while the RXL and RXZ variants get new alloy wheels. (The Sunny has alloys only on the XV variant). The Renault Scala is positioned at a slight premium to the Sunny, considering the extra features that it offers. All variants of the Scala offer ABS and airbags. The RXL and RXZ variants get alloy wheels and “Fine vision” meters on the instrument console. The RXZ also gets leather upholstery, power-folding mirrors, push-button ignition, follow-me-home headlamps and variable speed intermittent wipers. The diesel variants of the Scala are available only in the mid-trim and top-trim versions, while the petrol Scala comes only in the base and mid-trim variants. Renault sees more demand for diesel and hence has decided on this kind of model line-up, providing diesel car buyers much more features. Renault claims a mileage of 16.95 kmpl for the petrol and 21.64 kmpl for the diesel. This makes the Scala one of the most fuel-efficient cars in its class. The Renault Scala will compete with the Skoda Rapid, Honda City, Volkswagen Vento and Hyundai Verna. The car has a good mix of features and space still manages to hold on to the value-for-money proposition that the Sunny also has. The car’s biggest competitor is its own sibling the Nissan Sunny, which is slightly cheaper variant for variant. Renault has however tried to provide more value with a fresher design and a few more features variant for variant. The Scala base petrol variant is nearly Rs. 1 lakh more than the base Sunny, but comes with a few additional features – airbags, ABS and power windows, central locking etc, which you don’t get on the base Sunny. In the mid-variant petrol, again prices are about Rs. 80,000 more than the mid-variant Sunny – and Renault’s justification for this difference are the alloy wheels and fine-vision meters besides the cosmetic changes. The Renault Scala will add to the sales numbers of the Renault Nissan alliance. It may not eat into its sibling, the Nissan Sunny’s market share as the pricing difference of between Rs. 1 lakh (base variant), Rs. 80,000 (mid-variant) and Rs. 60,000 (on top-end variants) ensures that the cars are reasonably separated by price. It is likely to gather fresh buyers, similar to what the Skoda Rapid and Volkswagen Vento did to each other. (The Rapid is a badge-engineered Volkswagen Vento at slightly cheaper prices). However, this will only appeal to buyers who are really willing to pay a premium for looks alone! Will this strategy work for Renault? We think it will, as the Scala is a well-engineered product in its own right, and better than the Nissan Sunny in terms of looks. Want the looks, pay the premium! Share your thoughts on the Renault Scala with the community. What do you think of its pricing?